I first heard about this book in 2012 when there seemed to be a lot of hype about it, and I remember it being recommended to me by a friend. It was at one point a suggestion for the book club I am part of but was put aside in favour of Gone Girl by Gillian Flynn. I had forgotten about it for a while and then I saw it sitting on the bookshelves of a friend who kindly let me borrow it. The book is set in the 1920s, when Mabel and Jack have moved to Alaska to start a new life after their child is stillborn. They are struggling to cope with the wilderness; Jack spends his days trying to get the land ready for crops and Mabel is struggling to cope with the overwhelming sadness that her childlessness brings. One night after the snow has started to fall, it is as if some magical spell comes over them and they run around outside playing in the snow, and build a little child made of snow. The next morning, the snow child is gone, as are the mittens and scarf they had used to decorate it, and they start to see glimpses of a little girl running around the wilderness and leaving footprints in the snow. This sparks an upturn in Mabel and Jack’s lives and they become friends with some fellow farmers, get help on the farm and Esther a close friend for Mabel, but one who is much more grounded and doesn’t at first believe Mabel when she talks of the snow child they have made. The Snow Child was a bit of a slow starter for me. I wasn’t sure of the writing style and initially it struck me as a little unsophisticated, jumping straight into Mabel’s inner turmoil without much explanation or time for the reader to settle in. I put it aside for a week or so while I read The Sea Road and after going back to it I started to enjoy it a lot more. I think it helped that snow started to fall in Edinburgh that week so I was more than content to read a wintry tale. 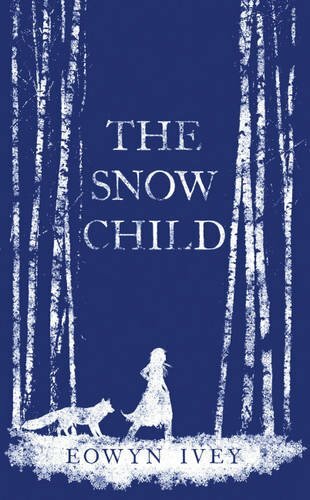 The plot of The Snow Child takes its inspiration from a Russian fairytale about an elderly, childless couple who build a child in the snow, who brightens their lives for a little while but disappears when they do not offer a reward to a fox who has saved their little snow child from getting lost. Mabel becomes a little obsessed with this tale, and uses it as an interpretation of Faina’s odd behaviour, as she disappears in the spring and returns in the winter, and becomes feverish if she becomes too warm. I found Mabel a little frustrating at times, she was prone to dwell on the negative things in her life and is constantly questioning their decision to move to Alaska and I think doesn’t quite appreciate the amount of work that Jack will have to do to get their land to a state that they live off of. Her character does develop quite a lot through the novel, in part due to Faina’s influence on their lives, but I would argue more so as a result of her friendship with Esther, her neighbour. I loved Esther, in fact she may have been one of my favourite characters in the novel and her down to earth and practical manner was refreshing in comparison to Mabel. There were some aspects to the book that I really loved. Faina’s life sounded magical, and I enjoyed the story of Faina and how she would roam about in the wilderness, living off of the land and being a bit of a free spirit. To be honest I think when I was a child I would have liked to do much the same thing! Although I think I was more of a summer baby… Jack and Mabel are always trying to tie her down though, saying she cannot live like a ‘woodland sprite’ all of her life and I think I resented the way they tried to tie her down just as she treats their attempts to comfort her with suspicion. I found the story a little predictable at times, but the descriptions of the landscape could be very evocative and I did feel drawn into the story and setting, feeling the cold and the harsh reality of living somewhere like Alaska. Without giving too much away I would have preferred either this to be more of a fairytale as I felt this lay at times in a bit of an awkward middle-ground between fantasy and reality. I think I was just craving something more magical because it was snowy outside though so it could just be me!